Rising star in the Reposado Tequila game. Casamigos — roughly translated as “house of friends” — was founded by Rande Gerber in 2013 in partnership with George (Jorge) Clooney. You might remember Rande Gerber as the husband of model Cindy Crawford, but he is also a serial entrepreneur in the restaurant and spirits business. The entire Casamigos line of Tequilas and Mescals are made the right way at the Productos Finos de Agave Distillery in Jalisco along with many other premium brands. That means the products are the “real deal.” Sales have taken off and the brand is now owned by Diageo. 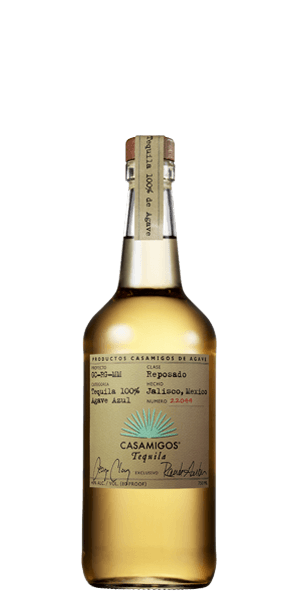 Casamigos Reposado is everything that you expect in a rested Tequila. It’s made from 100% Weber Blue Agave raised in the red clay soils of the Jalisco highlands. The piñas are slow-roasted for three days in traditional brick ovens and crushed. Importantly, the agave juice is fermented for eighty hours using a proprietary blend of yeast strains … and yes, it’s a closely-held secret. It’s aged for seven months in “reconditioned” ex-Bourbon casks and bottled at 40% ABV. What does Casamigos Tequila Reposado taste like? The Flavor Spiral™ shows the most common flavors that you'll taste in Casamigos Tequila Reposado and gives you a chance to have a taste of it before actually tasting it. Bright agave, smoke, peanut shells, vanilla. Caramel, brown butter, oak, tobacco, and more agave. Medium length with a puff of smoke on the back palate. Always come back to this one! I like Casamigos in general. Easy to drink - decent complexity. Renewed my appreciation for Tequilla. A smooth, smoky agave tequila. Love the vanilla and honey after taste. Shots, sipping or mixing with bourbon and/or rum was all great. Definitely on my home bar list. Great smooth tequila. My wife and family love this one! About $10-15 overpriced in my humble opinion. Love this stuff. Way to go George! Almost caramel. Yum. Smoothest tequila I’ve ever tasted. Doesn’t need anything added to it. The bourbon of tequila. Super smooth and very flavorful. A wonderful tequila to enjoy on the rocks. Makes me rethink the way I drink tequila. Will definitely buy again. The bottle is elegantly simple that makes it look like a timeless classic. Just had some again today. Very smooth with a vanilla and honey finish. Will buy some soon! is an outstanding agave aged for 7 months in American white oak casks, that have been reconditioned after originally being used for premium-aged whiskey. This tequila has taken on notes of home-made caramel, roasted agave & buttery vanilla, with a twinkle of oak-y spice & smoke on the finish. A pleasant, warm-feeling tequila. A great after-dinner drink.